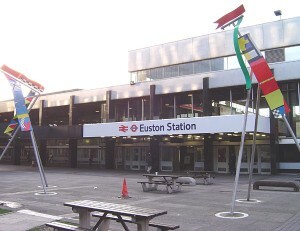 Euston station, opened in the year 1837, has become very famous for its design. Although it is one of the oldest stations in the capital of the United Kingdom, it still kept some architectural marks after ongoing reconstructions: the Portland stone entrance lodges, the statue of Robert Stephenson and the war memorial. You will be happy to know that Euston station is located close to several entertaining spots. The New Diorama (Theatre 15-16 Triton Street, Regents Place, NW1 3BF) offers theatre, comedy and opera shows. It also has a garden and a few popular coffee shops. However, the number of seats is limited to 80. Bach Unwrapped (Kings Place, 90 York Way, King’s Cross, London N1 9AG) is part of the largest annual series organized at Kings Place. 2013 is Johann Sebastian Bach’s year, marked by various recitals and concerts. Pangolin London (Kings Place, King’s Cross, 90 York Way, London N1 9AG) presents a variety of galleries, mostly with the purpose of raising funds for different humanitarian causes from all around the world. Bloomsbury Theatre (15 Gordon Street, Bloomsbury, London WC1H 0AH) is known for its experimental plays and music. Although it has been redesigned, it still keeps some of its original bomb-damaged church allure. Renoir Cinema (Brunswick Shopping Centre, Bloomsbury, WC1N 1AW) was opened in the year 1972 with The Trojan Women movie. It usually shows French films or independent, low budget productions. These are not the only cultural attractions. Wellcome Collection (183 Euston Road, Bloomsbury, London NW1 2BE) presents three interesting collections: Medicine Man, Medicine Now and special exhibitions. It is a great opportunity to see the works of great artists, like Andy Warhol and Leonardo da Vinci. St Pancras Church (Euston Road, Bloomsbury, London NW1 2BA) has a notable Greek architecture. Its reconstruction after the Great Fire cost a great deal of pounds. The British Library (96 Euston Road, King’s Cross, London NW1 2DB) presents over 150 million items and also special events, like exhibitions and public readings. In order to get rail transport from London Stansted Airport to Euston Station, you will have to take the Stansted Airport Train (that comes every 15 minutes) and then the Totttenham Hale Underground (every 5 minutes). Also, you can choose the London Stansted Bus (every 10 minutes) and then take the one from Marylebone that runs every 5 minutes. The total journey would take about 46 minutes with the train and 1 hour and 26 minutes by bus. So as to travel by car from London Stansted Airport to Euston Station, you must take the M11. London Stansted Airport is 36.5 miles away from Euston Station. A journey by taxi from Stansted Airport to Euston Station with 247 Stansted Airport Transfer is going to last around 1 hour and 30 minutes. The London Stansted Taxi to Euston Station starts from 58 GBP.